Young Greater Mancunians are being encouraged to get comfortable about discussing domestic abuse thanks to an awareness campaign which is set to tour schools and youth centres across the region. 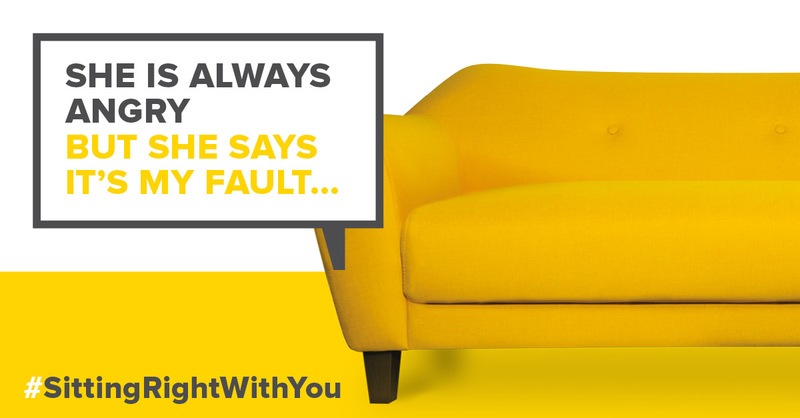 Initially launched in 2016, the ‘Sitting Right With You’ campaign features a bold yellow sofa and messages challenging young peoples’ thoughts about what domestic abuse is. It also aims to encourage anyone who has experienced domestic abuse to take that first brave step and ask for help. Two years later, the campaign and the sofa are on tour visiting schools and youth groups to create discussions amongst young people about the issue and what a healthy relationship looks like. Discussion points include reflecting on statements such as; ‘he doesn’t like me using social media’, ‘she doesn’t like me spending time with my friends anymore’ and ‘I get caught in the middle at home, I wish I could talk to someone’. It is hoped that young people will understand that domestic abuse doesn’t only include physical violence – it can also be controlling what someone wears, their money, where they go and who they talk to. If you or someone you know has been affected by domestic abuse, you can contact the Greater Manchester domestic abuse helpline for support on 0161 636 7525. How to overcome your biggest fear. Get Your 2019 Started Off Right!